2018 will be the 13th year of The Luberon Experience, our tour in Provence. Over 530 people have joined us for this special week, many returning for a second time. We were thrilled that The Luberon Experience was recognized by National Geographic Traveler magazine as one of their top 50 Tours of a Lifetime in 2012. Visit www.luberonexperience.com to learn much more about this beautiful area, our village of Bonnieux, and our week in Provence. Our base for The Luberon Experience is the ancient perched village of Bonnieux (seen above, left) with sweeping views across the valley. Our family lived in this village during our six month stay in the Luberon a few years ago. Bonnieux is now our second home. We have an apartment in the village and are there several months a year. Our friends always give our groups a warm welcome. Because of our relationships in the area and the size of our groups, our trips include many very unique experiences that wouldn’t be possible on your own or with another tour. 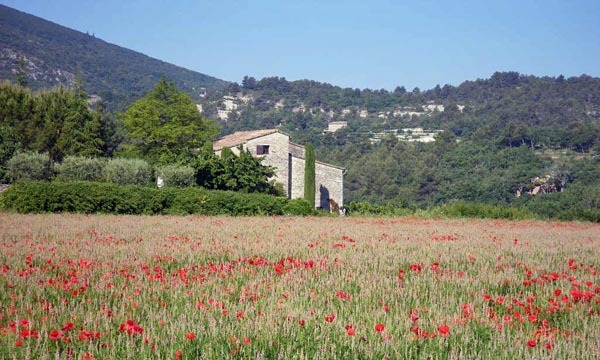 With a population of 1400, Bonnieux is an ideal base to enjoy village life in Provence. It’s small enough to be intimate, but large enough to offer important services, interesting shopping, and a variety of eating places. Our eight-room guesthouse is located right in the village with a beautiful garden and swimming pool. By the end of the week Bonnieux feels like home to our travelers too. The Luberon offers a wide diversity of experiences for a week-long stay: a rich history dating back to prehistoric and Roman times, incredible landscapes of mountains and farmland, hilltop stone villages, the ruins of old castles, delightful outdoor markets, and outstanding cuisine and wine. A walking tour of Bonnieux, including a visit hosted by our friend Michele to to the ancient caves beneath her home that date back over 1500 years and were quarters for the Knights Templar in the 12th century. Visits to the nearby perched villages of Lacoste, Gordes, Roussillon and Saignon. Outdoor markets at L’Isle-sur-la-Sorgue, Gordes and Bonnieux, each providing a very different experience. A private tour and wine tasting at one of the top wineries in the region, hosted by a good friend (the winemaker). A very special winery lunch at a local wine estate, hosted by our friends Marie and Djune. You’ll love the enchanting setting in the vineyards. Several options for walks, including an easy walk in the Fôret de Cèdres (on top of the Petit Luberon mountain), a hike to the ruins of Fort de Buoux, and a morning walk to Lacoste. We always provide interesting options for those who prefer other activities. A visit to a goat farm near Saignon, including a tasting featuring a variety of Marianne’s delicious goat cheeses. A day beyond the Luberon, usually to Les Alpilles, a mountainous area about an hour west of the Luberon. We’ll visit Roman ruins, the sanitarium where Van Gogh spent a year painting, and the incredible light and music show near Les Baux. A memorable evening at our friend Janice’s home, enjoying a relaxing dinner in her garden. Wonderful meals in a variety of settings, where we’ll experience the famous specialties and cuisine of Provence. Two of our lunches are picnics… always highlights of our week. Plenty of free time to enjoy the village and our beautiful little hotel. We meet travelers at the Avignon TGV station on Saturday afternoon; this is also our drop-off point the following Saturday morning. Many travelers begin or end their stay in France with a few days in Paris. Avignon, Aix-en-Provence and Marseille are also interesting destinations in Provence, easily reached from Paris on the high-speed TGV train. Interested in this trip? See our Luberon Experience website for much more information about this wonderful week in Provence.